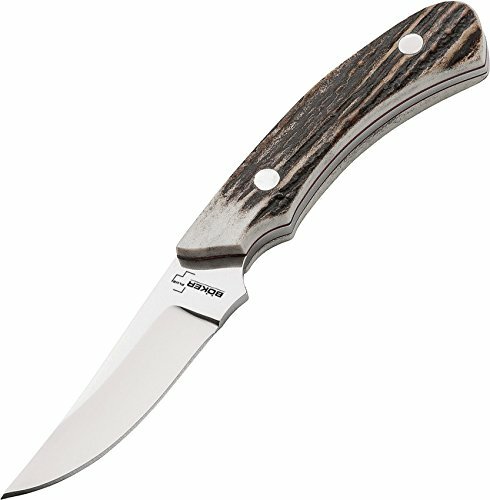 The Boker Plus 02BO515 Cowboy Crossdraw Knife is designed by New Mexico custom knifemaker Don Hethcoat provided us with this stout and formidable stag fixed blade, the Cowboy Crossdraw. The upswept blade of 440C stainless steel provides all the punch needed for everyday work chores, as well as providing an excellent skinning knife. The unique leather sheath, with sewn-in magnet, is worn to enable quick draw, as well as comfortable carry when on horseback or cruising on a motorcycle. Blade length: 2 7⁄8 in. Overall length: 6 3⁄8 in. Weight: 5 oz. This Boker Plus knife isn’t just for cutting, it’s for leaving a mark. Limited lifetime warranty. A chestnut tree is the world famous trademark of the Boker knife manufactory in Solingen, Germany. It represents innovative, high quality, exceptional knives, manufactured with pride, by hand, for over 145 years. Blade length: 2⅞". Overall length: 6⅜". Weight: 5 oz.